As those of you who've read previous entries will know, this year was when I was travelling to Paris and to the Western Front. It was a work trip, so couldn't be focused around my genealogy interests, but there were always going to be several opportunities along the way. It really didn't disappoint. I don't know that I will ever be able to do justice to the amazing experience which I had, tracing the footsteps of the many members of my family who made that same journey 100 years ago. I stood on battlefields where cousins bled and died, a long way from home. I sat overlooking the infamous Sausage Valley in Pozieres which I know cost at least one of my ancestors his sanity. I walked down streets great-uncles were paraded on as prisoners of war, I saw plaques commemorating sons whose mothers were never given the opportunity to leave flowers... all among pristine and picturesque scenery, where 100 years ago there was just mud and ruin. There really are no words, and I'm not really going to blog a report of the trip because I can't even begin to explain those experiences and how grateful I am to have had them. Paris was beautiful of course, but it's the Western Front that will stay with me for years to come. What I am going to blog about is some tips which may be of benefit to any readers contemplating such a trip in future, so that you can make the most of your visit. Most of us have ancestors and relations on the major memorials to the missing, like Villers-Bretonneux and the Menin Gate. Both are split by battalion, so it's crucial you have a record of this when you arrive. 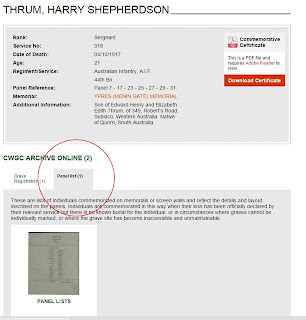 When it comes to the Menin Gate, the Commonwealth War Graves also provide a panel number to help you narrow down your search, but make sure you use the reference found on the PANEL LIST which is the second image provided rather than the Panel Reference or the Burial Register: all three will give you different numbers. You can place wired poppies alongside the names at these memorials, just like the Canberra AWM, but some at VB will be too high up, so you may need to place a memorial on a stick in the ground below instead. Villers-Bretonneux is more simple as the battalions are all Australian and listed in numerical order, starting with the infantry then the more specialised units such as the Pioneers. I'd also recommend reading up on both war records and battalion histories to track where your ancestors fought. You want to pack light, so I recommend recording the information in a table you can print out or something similar. Before I left, I'd packed two things. One was an entire bag full of wired poppies for our group, the other was a zip-loc bag of sand from our local beach to sprinkle on the graves of the servicemen we would be visiting from our area. (Shhh - don't tell. While it's legal to bring sand into France, Australian law says you can't remove sand from a beach. Totally frigging hilarious when you consider the large amount which ends up in your towel, shoes, bathers and other places every time you visit, and no doubt just intended to stop those of us who live near one using it as a source for our kids' sand-pits etc.) However, when I got there I discovered lots of people had made up laminated cards with pictures and biographies of their relations, knitted poppies, clip-on koalas, football scarves and other tributes. I've read about people sprinkling graves with whiskey, beer, reading particular poems or stories at key sights and more. I wish I had done some of those things. Poppies were easy to buy locally, including wooden crosses which you can write messages on. I may be going again in 2017 and am already working on preparing cards for each of my relations as well as collecting suitable items to leave them. Along the Western Front are many sellers of militaria, museums, visitor and tourist centres, all of whom offer a variety of services. You can collect maps and brochures which will greatly add to your understanding of your relatives' war service. You can buy items to help you remember their service. I personally chose to invest in vintage postcards of they type sent home by soldiers. Many of these have pictures of local areas, including showing the impact of the shelling. You can buy items from the infamous 'iron harvest' dug up by local farmers each year: shells, shot and 'trench art' from WW1, but I've been lead to believe virtually all of these will be confiscated by Australian customs so there isn't much point to purchasing any of it. It's worth stopping to have a chat to anyone you can about what else they know and can share about the war. While at the Museum dedicated to the Battle of Passchendaele at Zonnebeke, I discovered that they were working on creating an archive of all soldiers listed on the Menin Gate. "Ah!" I thought. "I have a relative on the Menin Gate." On returning home I dutifully went to their archive centre's link to fill in the questionnaire about my 3x great-uncle's war service, sending in what I know about his life, family, enlistment and of course a picture, which will help them build up a more detailed and lasting record to commemorate those men who gave their lives in the defense of Passchendaele, Zonnebeke, Ypres/Ieper and surrounds. 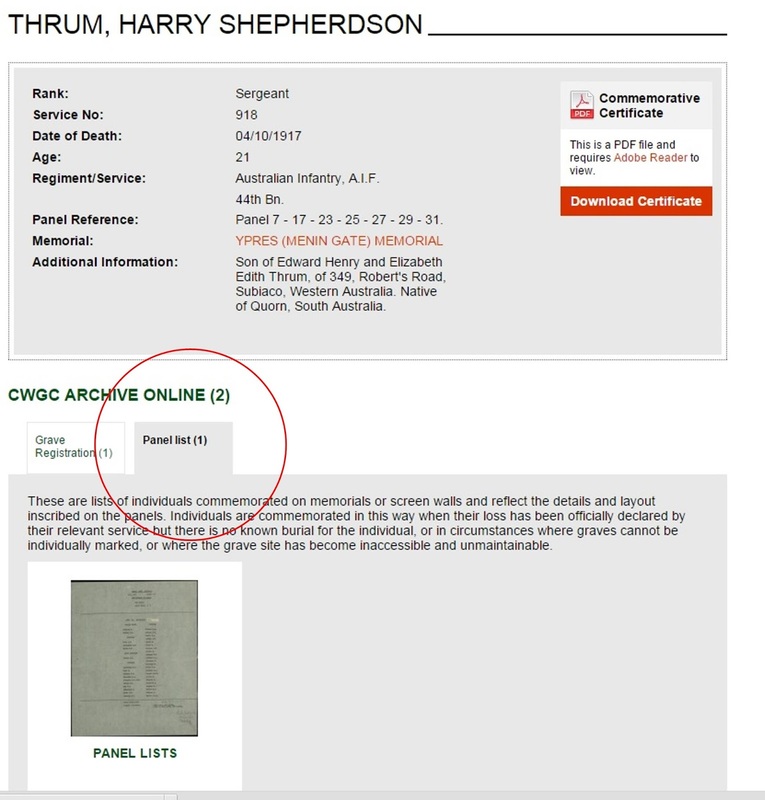 It turns out that while my 3x great uncle is officially 'missing', in that his body has never been recovered and formally interred in a war cemetery, his war record contains a map reference for his hasty burial during battle. British and allied war forces used a consistent mapping system, which you can see here. My ancestor is buried in a location on Map 28NE. The archive centre at Zonnebeke can help people in my situation by sending out a map indicating where the location is on a modern map so that next time I go, I'll be able to visit the exact spot my 3x great uncle fell. I think it's a safe bet I'll be the only member of my family ever to get do so, and I'm just delighted that I can represent my whole family in this way. The archive centre will take a few months to get onto the maps as they have quite a back-log, so leave yourself plenty of time before a visit to get it organised. Maybe this is all you'll ever find, but maybe not: it's worth checking. As the famous slogan goes... You'll never, ever know if you never, ever go. Or something like that. You can look at pictures and read all you like, but there's something about actually being in the locations of significance to your ancestors that makes you feel their story all around you. The Armchair Genealogist recently put together an excellent entry to help you organise your genealogical travel, and she's right. So get your Kindle stuffed full of appropriate reading for the long-haul flight*, start saving your pennies, get off your arse and plan that trip! *I caught up on David Combe's newest, "The Three Rabbits Alibi". David takes stories discovered from some seriously top level Troving and then investigates them. Archives, Trove, colonial history and true crime in one delightful package. Such a lot of work involved, it obviously makes the trip more rewarding. It is ironic about the sand. When I was on a tour in Hawaii they said their Waikiki Beach is filled with sand from Newcastle because it doesn't have its own. There's a whole lot of sand that's allowed to leave our country. I'd done a bit of prep so had some stuff covered, but I kept looking around and seeing cool things other people had done and realised we could have done so much more if we'd known what to expect. Hopefully this post can help someone else out there make the most of their experience traveling to the Western Front. I'm doing a 4 day Western Front tour next week. I've read a couple of fat books and got a list of our family's servicemen but, after reading your post, realise there is more I could have done. I'll see what I can manage in the next few days before I depart. Thanks for your excellent advice. Hope it's helped, Jill. Have a GREAT trip!